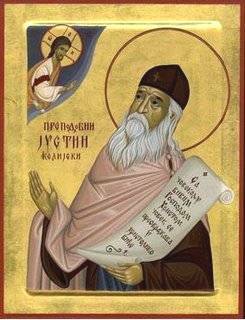 St. Justin Popovich: In truth there is only one freedom . . . This entry was posted in Sayings from Saints, Elders, and Fathers, St. Justin Popovich and tagged Freedom, Harrowing of Hell, Sin, Slave, Slavery, The Evil One on June 29, 2015 by . was sent to enquire about his own brothers. let us kill him, and all will be ours’. sold him, slaying him in intent. while eating the Passover, slew the Saviour. the descent to earth of our Saviour. of the dread and near invincible tyrant. every sin of the world, was placed in a grave. in the tomb for three days, not undergoing corruption. proclaiming resurrection and everlasting life. above the Cherubim, as Only-begotten Son. whom they had not wanted to be king over them. was suddenly found to be ruling over them. all those who did not want him to rule over them. for salvation, to save our souls. and the Son of God who was crucified by them. a true type of his own Master. This entry was posted in Sayings from Saints, Elders, and Fathers, St. Ephraim the Syrian and tagged Cross, Crucifixion, Falsely Accused, Final Judgement, Forgiveness, Forgiveness of Others, God as Father, God as Judge, God as King, Harrowing of Hell, Jews, Joseph Sold into Slavery, Judgment Day, King, Love, Loving Enemies, Old Testament Events, Old Testament People, Overcoming Sin/Passions, Pascha, Passions, Passover, Patriarch Jacob, Patriarch Joseph, Pharoh, Repentance, Resurrection, Salvation, Shame, Slavery, Type of Christ on March 26, 2014 by . 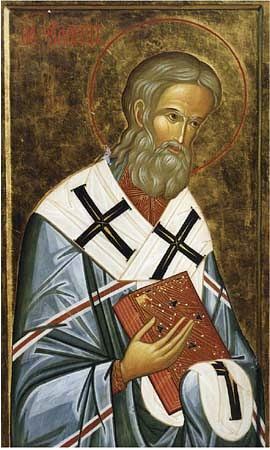 St. Justin Martyr: To yield and give way to our passions . . . This entry was posted in St. Justin Martyr and tagged Freedom, Overcoming Sin/Passions, Passions, Slavery on February 18, 2014 by . These are the distinguishing marks of the foundation. As a foundation is shown to be firm, and as letters are inscribed upon a stone that the letters may be significant. But these letters are shown by works, “Having,” he says, “this seal” fixed thereon, “Let every one that nameth the name of the Lord depart from iniquity.” Thus if any one is unrighteous, he is not of the foundation. So that this too is of the seal, not to do iniquity. Moral. Let us not therefore put off from us the royal seal and token, that we may not be of those who are not sealed, that we may not be unsound, that we may be firmly grounded, that we may be of the foundation, and not carried to and fro. This marks them that are of God, that they depart from iniquity. For how can any one be of God Who is just, if he does iniquity, if by his works he opposes Him, if he insults Him by his misdeeds? Again we are speaking against injustice, and again we have many that are hostile to us. For this affection, like a tyrant, has seized upon the souls of all, and, what is worse, not by necessity nor violence, but by persuasion and gentle insinuation, and they are grateful for their slavery. And this is indeed the misery; for if they were held by constraint and not by love, they would soon depart. And whence is it, that a thing which is most bitter, appears to be sweet? Whence is it that righteousness, which is a most sweet thing, becomes bitter? It is the fault of our senses. Thus some have thought honey bitter, and have taken with pleasure other things that were noxious. And the cause is not in the nature of things, but in the perverseness of the sufferers. The judging faculty of the soul is disordered. Just as a balance, if its beam be un-steady, moves round, and does not show accurately the weight of things placed in it; so the soul, if it has not the beam of its own thoughts fixed, and firmly riveted to the law of God, being carried round and drawn down, will not be able to judge aright of actions. For less than the price of a cup of fancy coffee, you can get The Complete Ante-Nicene & Nicene and Post-Nicene Church Fathers Collection which can be read with the the free Kindle reading app. This includes 3 Series, 37 Volumes, 65 Authors, 1,000 Books, 18,000 Chapters, 16 Million Words. This entry was posted in Sayings from Saints, Elders, and Fathers, St. John Chrysostom and tagged Commandments, Final Judgement, Judgement, Justice, Morals, Overcoming Sin/Passions, Righteousness, Scripture Epistle 1 Timothy, Slave to Sin, Slavery, Soul on October 22, 2013 by .